Have you got a career plan? Don’t know what you want to do? If you’re not sure what you want to do, or how to make a start with planning your graduate career these top tips might help. Self-assess – What skills do you have? Which parts of your degree have you enjoyed most? Do you have work experience? Knowing what you are good at and which environments you thrive in is the first step – our skills audit checklist is a good place to start. Knowledge is power – Start using online resources to explore your options. Attend our careers events and engage with employers. Knowing the reality of a role and the recruitment process is vital to making the right decision. We can provide advice and support whatever stage you’re at in planning your graduate career, and can help you to discover a world full of career possibilities. 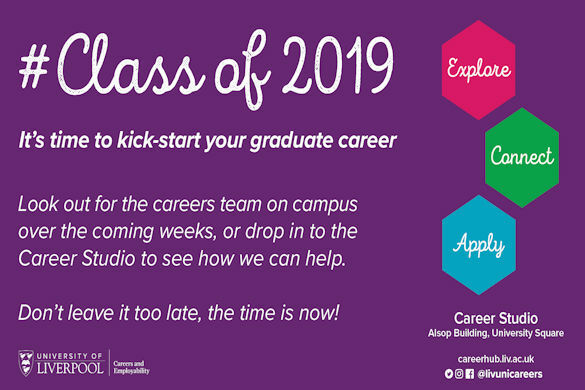 Drop in to see us in the Career Studio on University Square or look out for our pop-up Career Studio on campus. Can’t make it in? Ask us a Question via our website or click here to access our online resources.